"Binner" redirects here. For the surname, see Binner (surname). "Trashers" redirects here. For the ice hockey team, see Danbury Trashers. "Dumpster diver" redirects here. For the bird, see Australian white ibis. Dumpster diving, (also totting, skipping, skip diving or skip salvage,) is the salvaging of waste in large commercial, residential, industrial and construction containers to find items that have been discarded by their owners, but that may prove useful to the picker. It is not confined to dumpsters specifically, and may cover standard household waste containers, curb sides, landfills or small dumps. Different terms are used to refer to different forms of this activity. For picking materials from the curbside trash collection, curb shopping, trash picking or street scavenging are sometimes used. When seeking primarily metal to be recycled, one is scrapping. When picking the leftover food from traditional or industrial farming left in the fields one is gleaning. It is viewed as an effective modern foraging technique. People dumpster dive for items such as clothing, furniture, food, and similar items in good working condition. Some people do this out of necessity due to poverty, while others do so professionally and systematically for profit. The term "dumpster diving" emerged in the 1980s, combining "diving" with "dumpster", a large commercial trash bin. The term "Dumpster" itself comes from the Dempster Dumpster, a brand of bins manufactured by Dempster Brothers beginning in 1937. "Dumpster" became genericized by the 1970s. According to the Oxford English Dictionary, the term "dumpster diving" is chiefly found in American English and first appeared in print in 1983, with the verb "dumpster-dive" appearing a few years later. In British English, the practice may be known as "skipping", from skip, another term for this type of container. Alternative names for the practice include bin-diving, containering, D-mart, dumpstering, totting, and skipping. In Australia, garbage picking is called "skip dipping." The term "binner" is often used to describe individuals who collect recyclable materials for their deposit value. For example, in Vancouver, British Columbia, binners, or bottle collectors, search garbage cans and dumpsters for recyclable materials that can be redeemed for their deposit value. On average, these binners earn about $40 a day for several garbage bags full of discarded containers. The karung guni, Zabbaleen, the rag and bone man, waste picker, junk man or bin hoker are terms for people who make their living by sorting and trading trash. A similar process known as gleaning was practised in rural areas and some ancient agricultural societies, where the residue from farmers' fields was collected. Some dumpster divers, who self-identify as freegans, aim to reduce their ecological footprint by living from dumpster-dived-goods, sometimes exclusively. The organization Same Day Dumpsters has written, "Traditionally, most people who resorted to dumpster-diving were forced to do so out of economic necessity, but this is not the case today." However, the activity is performed by people out of necessity in the developing world. Some scavengers perform in organized groups, and some organize on various internet forums and social networking websites. By reusing, or repurposing, resources destined for the landfill, dumpster diving is sometimes considered to be an environmentalist endeavor, and is thus practiced by many pro-green communities. The wastefulness of consumer society and throw-away culture compels some individuals to rescue usable items (for example, computers or smartphones, which are frequently discarded due to the extensive use of planned obsolescence in the technology industry) from destruction and divert them to those who can make use of the items. A wide variety of things may be disposed while still repairable or in working condition, making salvage of them a source of potentially free items for personal use, or to sell for profit. Irregular, blemished or damaged items that are still otherwise functional are regularly thrown away. Discarded food that might have slight imperfections, near its expiration date, or that is simply being replaced by newer stock is often tossed out despite being still edible. Many retailers are reluctant to sell this stock at reduced prices because of the risks that people will buy it instead of the higher-priced newer stock, that extra handling time is required, and that there are liability risks. In the United Kingdom, cookery books have been written on the cooking and consumption of such foods, which has contributed to the popularity of skipping. Artists often use discarded materials retrieved from trash receptacles to create works of found objects or assemblage. Students have been known to partake in dumpster diving to obtain high tech items for technical projects, or simply to indulge their curiosity for unusual items. Dumpster diving can additionally be used in support of academic research. Garbage picking serves as the main tool for garbologists, who study the sociology and archeology of trash in modern life. Private and government investigators may pick through garbage to obtain information for their inquiries. Illegal cigarette consumption may be deduced from discarded packages. Dumpster diving can be hazardous, due to potential exposure to biohazardous matter, broken glass, and overall unsanitary conditions that may exist in dumpsters. Arguments against garbage picking often focus on the health and cleanliness implications of people rummaging in trash. This exposes the dumpster divers to potential health risks, and, especially if the dumpster diver does not return the non-usable items to their previous location, may leave trash scattered around. Divers can also be seriously injured or killed by garbage collection vehicles; in January 2012, in La Jolla, Swiss-American man Alfonso de Bourbon was killed by a truck while dumpster diving. Further, there are also concerns around the legality of taking items that may still technically belong to the person who threw them away (or to the waste management operator), and whether the taking of some items like discarded documents is a violation of privacy. In general a legal concept called abandonment of property covers this question of the subject of ownership of property that is disposed of. Discarded billing records may be used for identity theft. As a privacy violation, discarded medical records as trash led to a $140,000 penalty against Massachusetts billing company Goldthwait Associates and a group of pathology offices in 2013 and a $400,000 settlement between Midwest Women's Healthcare Specialists and 1,532 clients in Kansas City in 2014. Since dumpsters are usually located on private premises, divers may occasionally get in trouble for trespassing while dumpster diving, though the law is enforced with varying degrees of rigor. Some businesses may lock dumpsters to prevent pickers from congregating on their property, vandalism to their property, and to limit potential liability if a dumpster diver is injured while on their property. Dumpster diving is often not prohibited by law. Abandonment of property is another principle of law that applies to recovering materials via dumpster diving. 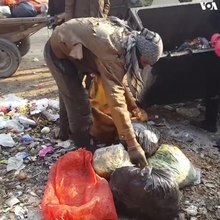 Police searches of discarded waste as well as similar methods are also generally not considered violations; evidence seized in this manner has been permitted in many criminal trials. In the United States this has been affirmed by numerous courts including and up to the Supreme Court, in the decision California v. Greenwood. The doctrine is not as well established in regards to civil litigation. Companies run by private investigators specializing in such techniques have emerged as a result of the need for discreet, undetected retrieval of documents and evidence for civil and criminal trials. Private investigators have also written books on "P.I. technique" in which dumpster diving or its equivalent "wastebasket recovery" figures prominently. In 2009, a Belgian dumpster diver and eco-activist nicknamed Ollie was detained for a month for removing food from a garbage can, and was accused of theft and burglary. On February 25, 2009, he was arrested for removing food from a garbage can at an AD Delhaize supermarket in Bruges. Ollie's trial evoked protests in Belgium against restrictions from taking discarded food items. In Ontario, Canada, the Trespass to Property Act—legislation dating back to the British North America Act of 1867—grants property owners and security guards the power to ban anyone from their premises, for any reason, permanently. This is done by issuing a notice to the intruder, who will only be breaking the law upon return. Similar laws exist in Prince Edward Island and Saskatchewan. A recent case in Canada, which involved a police officer who retrieved a discarded weapon from a trash receptacle as evidence, created some controversy. The judge ruled the policeman's actions as legal although there was no warrant present, which led some to speculate the event as validation for any Canadian citizen to raid garbage disposals. Skipping in England and Wales may qualify as theft within the Theft Act 1968[original research?] or as common-law theft in Scotland, though there is very little enforcement in practice. In Germany, dumpster diving is referred to as "containern", and a waste container's contents are regarded as the property of the container's owner. Therefore, taking items from such a container is viewed as theft. However, the police will routinely disregard the illegality of garbage picking since the items found are generally of low value. There has only been one known instance where people were prosecuted. In 2009 individuals were arrested on assumed burglary as they had surmounted a supermarket's fence which was then followed by a theft complaint by the owner; the case was suspended. In the United States, the 1988 California v. Greenwood case in the U.S. Supreme Court held that there is no common law expectation of privacy for discarded materials. There are, however, limits to what can legally be taken from a company's refuse. In a 1983 Minnesota case involving the theft of customer lists from a garbage can, Tennant Company v. Advance Machine Company (355 N.W.2d 720), the owner of the discarded information was awarded $500,000 in damages. Dumpster diving is practiced differently in developed countries than in developing countries. Food. In many developing countries, food is rarely thrown away unless it is rotten as food is scarce in comparison to developed nations. In countries like the United States, where 40 to 50 percent of food is wasted, the trash contains a lot more food to gather. In many countries, charities collect excess food from supermarkets and restaurants and distribute it to impoverished neighbourhoods. Trash pickers, Karung guni, Zabaleen, and rag and bone men in these countries may concentrate on looking for usable items or scrap materials to sell rather than food items. In the United States, Canada, and Europe, some bakeries, grocery stores, or restaurants will routinely donate food according to a Good Samaritan Food Donation Act, but more often, because of health laws or company policy, they are required to discard food items by the expiration date, because of overstock, being overly ripened, spoiled, cosmetically imperfect, or blemished. Books and periodicals. As proof to publishing houses of unsold merchandise, booksellers will routinely remove the front covers of printed materials to render them destroyed prior to disposing of their remains in the garbage. Though readable, many damaged publications have disclaimers and legal notices against their existence or sale. Irregular or damaged goods. Offices, factories, department stores, and other commercial establishments may equally throw out non-perishable items that are irregular, were returned, have minor damages, or are replaced by newer inventory. Many items tend to be in such a state of disrepair or cosmetically flawed that they will require some work to make the items functionally usable. For this reason, employees will at times intentionally destroy their items prior to being discarded to prevent them from being reused or resold. Returned items. Manufacturers often find it cheaper to routinely discard items returned as defective under warranty instead of repairing them, although a device is often repairable or usable as a source of spare parts to repair other, similar discarded devices. School Supplies. At the end of each school year many people throw away perfectly useful supplies like pencils, pens, notebooks, art supplies, backpacks and more just to buy brand new ones a few months later at the beginning of the next school year. Many of these items still have plenty of useful life left in them. eWaste. Some consumer electronics are dumped because of their rapid depreciation, obsolescence, cost to repair, or expense to upgrade. Owners of functional computers may find it easier to dump them rather than donate because many nonprofit organizations and schools are unable, or unwilling, to work with used equipment, making the otherwise intact devices attractive to those who seek to collect, repair or restore such equipment. Some organizations like Geeks Into The Streets, reBOOT, Free Geek and Computerbank try to refurbish old computers for charity or educational use. Occasionally, vendors dispose of unsaleable, non-defective new merchandise as landfill. The Atari video game burial in Alamogordo, New Mexico after the North American video game crash of 1983 is a well-known example; a 2014 excavation recovered about 1300 games for curation as museum exhibits or auction. Clothing. While thrift stores routinely refuse used goods which they cannot cheaply and easily resell, the items which they do accept cost them nothing. There is therefore no shrinkage cost associated with discarding mendable garments, repairable appliances or even working donated items which are overstock or find no buyer after some arbitrary length of time. Metal. Sometimes waste may contain recyclable metals and materials that can be reused or sold to recycling plants and scrap yards. The most common recyclable metals found are steel and aluminum. Wood. Called urban lumberjacking, to salvage wood either for home heating, or home construction projects. Residential buildings. Clothing, furniture, appliances, and other housewares may be found at residential buildings. There is a risk that discarded bedding and furniture may contain bed bugs, a hazard that is best avoided. College dormitories. Items may be found at colleges with dormitories at the end of the semester when students throw away many items such as furniture, clothes and electronics. In the 1960s, Jerry Schneider, using recovered instruction manuals from The Pacific Telephone & Telegraph Company, used the company's own procedures to acquire hundreds of thousands of dollars' worth of telephone equipment over several years until his arrest. The Castle Infinity videogame, after its shutdown in 2005, was brought back from the dead by a fan rescuing its servers from the trash. 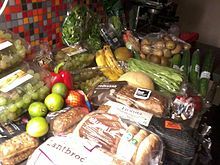 Food Not Bombs is an anti-hunger organization that gets a significant amount of its food from dumpster diving from the dumpsters at small markets and corporate grocery stores in the US and UK. In October 2013, in North London, three men were arrested and charged under the 1824 Vagrancy Act when they were caught taking discarded food: tomatoes, mushrooms, cheese and cakes from bins behind an Iceland supermarket. The charges were dropped on 29 January 2014 after much public criticism as well as a request by Iceland's chief executive, Malcolm Walker. Author John Hoffman wrote two books based on his own dumpster-diving exploits: The Art and Science of Dumpster Diving (1993 ; ISBN 978-1-58160-550-1) and Dumpster Diving: The Advanced Course: How to Turn Other People's Trash into Money, Publicity, and Power (2002; ISBN 978-1-58160-369-9), and was featured in the documentary DVD The Ultimate Dive, which was directed by Suzanne Girot and described by the Internet Movie Database as a "Tongue-in-cheek how-to film on the art and science of dumpster diving." In 2001, dumpster diving was popularized in the book Evasion, published by CrimethInc. In Kim Stanley Robinson's science fiction novel Fifty Degrees Below (2005), the character Frank Vanderwal joins, for a time, a group of freegans (referred to as "fregans" in the novel) who frequently prepare feasts culled from dumpsters; kind-hearted restaurateurs aid them by setting aside foods which have not been touched by the public. Jeff Ferrell, Professor of Sociology at Texas Christian University, is the author of Empire of Scrounge: Inside the Urban Underground of Dumpster Diving, Trash Picking, and Street Scavenging (2005; ISBN 978-0-81472-738-6). Cory Doctorow integrated garbage picking characters into the plots of his novels Someone Comes to Town, Someone Leaves Town and Pirate Cinema. In the former one, the character Kurt gathered all his belongings solely by garbage picking and it is revealed that the main character did dive as well; in the latter one the character Jem who lives on the street introduces protagonist Trevor to the practice of dumpstering to acquire food to survive. British television shows have featured home renovations and decoration using salvaged materials. Changing Rooms (1996-2004) is one such show, broadcast on BBC One. Surfing the Waste: A Musical Documentary About Dumpster Diving, a film by Paul Aflalo, Sandra Lombardi and Tomoe Yoshihara, with music composed by Alden Penner and Nic Boshart. I Love Trash (2007), a 30-minute documentary by David Brown and Greg Mann. OCLC's WorldCat provided a synopsis: "I Love Trash is a documentary about the art of dumpster diving. Starting with an empty apartment, only the clothes they were wearing and a flashlight, David and Greg find everything they might otherwise buy, in trash cans and dumpsters. All their food, clothes, electronics, art materials and entertainment, all out of the trash." Accolades: Skyfest Film and Script Festival, (won 2nd place for Documentary Films); and Lake Michigan Film Competition, (won 3rd place for Documentary films). The 2010 documentary film Dive!, a short documentary written and directed by Jeremy Seifert, investigates dumpster diving in the Los Angeles area. Dive! premiered in October 2009 at the Gig Harbor Film Festival, where it won the Audience Choice Award. It has gone on to win awards at many other film festivals, including Best Documentary at the DC Independent Film Festival and Best Film at the Dutch Environmental Film Festival. Spoils: Extraordinary Harvest. A short film/mystery film and documentary by Alex Mallis. (2012) Accolades: Official Selection, New Orleans Film Festival. Official Selection, Independent Film Festival of Boston. Official Selection, DOC NYC. The Leftovers: A Documentary about People Who Eat Trash (2008), a 28-minute Swedish documentary by Michael Cavanagh and Kerstin Übelacker. Mykel Bently, Paul Hood, Krystal Trickey, Nick Gill, and Sofia Arborelius (the latter two were exchange students) joined together for this dumpster diver adventure. From Dumpster To Dinner Plate (2011), an award-winning New Zealand short documentary directed by Vanessa Hudson. "As the cost of food reaches record highs an underground movement of dumpster divers is rapidly gaining momentum fuelled by consumers who are forced to find creative ways to feed themselves." ^ a b "Hand sorting of recyclables ('totting') with vehicle assistance" (PDF). Health & Safety Executive. May 2012. Archived from the original (PDF) on 30 September 2015. Retrieved 10 January 2016. ^ Boisseau, Will; Donaghey, Jim (2015). ""Nailing Descartes to the wall": Animal rights, veganism and punk culture" (PDF). In Nocella, Anthony (ed.). Anarchism and animal liberation : Essays on complementary elements of total liberation. Jefferson, North Carolina: McFarland & Company. p. 85. ISBN 978-0-7864-9457-6. OCLC 913784877. ^ a b Lewycka, Marina (2 July 2009). "So, I'm a skip addict - avocado bath suite, anyone?". London Evening Standard. Archived from the original on 6 June 2011. Retrieved 2009-10-31. ^ a b "Issue 561". SchNEWS. 22 September 2006. Retrieved 2009-11-11. ^ Ferrell, Jeff (2005). Empire of Scrounge: Inside the Urban Underground of Dumpster Diving, Trash Picking, and Street Scavenging. New York University Press. ISBN 978-0-81472-738-6. ^ a b Admin. "The Do's and Don'ts of Dumpster Diving". Wilderness Survival Techniques. Retrieved 9 March 2012. ^ a b c d Rufus, A.; Lawson, K. (2009). The Scavengers' Manifesto. Penguin Publishing Group. pp. 165–167. ISBN 978-1-101-02476-8. ^ a b "dumpster diving, n". Oxford English Encyclopedia. University of Oxford Press. 1993. Retrieved September 17, 2015. ^ "dumpster, n". Oxford English Dictionary. University of Oxford Press. 1993. Retrieved September 17, 2015. ^ Erin McKean, ed. (2005). The New Oxford American Dictionary (second ed.). Oxford University Press. ISBN 978-0-19-517077-1. ^ "skip, n.2". Oxford English Dictionary. University of Oxford Press. 1993. Retrieved September 17, 2015. ^ Renton, Alex (August 17, 2007). "Why I love bin diving". The Guardian. London. Retrieved November 28, 2009. ^ "Dumpster diving stays on trend in Germany". Dw-world.de. Retrieved 30 January 2014. ^ Niki D'Andrea (2012-08-30). "Dumpster Dining: For Freegans, Eating Garbage Is Getting Downright Trendy - Page 1 - News - Phoenix". Phoenix New Times. Retrieved 2012-09-07. ^ Colon, Dalia (April 11, 2008). "One man's trash is another man's ... lunch ≤or software treat≥". St. Petersburg Times. Retrieved November 28, 2009. ^ "Skipping Diner". 2010. Retrieved 2012-09-11. ^ Jackson, Emily (2010-07-28). "Vancouver fireworks a boon for city". The Vancouver Sun. Retrieved 2010-08-04. ^ a b c d e f Mansvelt, Juliana (2011). Green Consumerism: An A-to-Z Guide. Sage reference series on green society. SAGE Publications. pp. 106–108. ISBN 978-1-4129-9685-3. ^ Jules. "Are you really interested in Dumpster Diving?". Same Day Dumpsters. Retrieved 12 March 2012. ^ Sachs, Andrea (7 November 2004). "Get Your Mind Into the Gutter". The Washington Post. Retrieved 20 January 2010. ^ Allison, Cyndeth (8 May 2007). "Dumpster Diving". North Denver News. Archived from the original on November 3, 2007. ^ Gee, Alastair (28 December 2017). "Death in an Amazon dumpster". Retrieved 28 January 2018 – via www.TheGuardian.com. ^ Schwab, Dave (11 January 2012). "Victim in alleyway dumpster death identified as Alfonso de Bourbon, 83". La Jolla Light. Archived from the original on 20 February 2014. Retrieved 30 January 2014. ^ "Doctors, billing company pay $140,000 penalty for records tossed in public dump". Boston Globe. Retrieved 30 March 2015. ^ "Settlement reached in medical billing records case". kansascity. Retrieved 30 March 2015. ^ Auteur: Arne Franck. "De Standaard: Arrogante houding houdt voedseldief in de cel". Standaard.be. Retrieved 2009-05-07. ^ "Update Skipper in de Brugse gevangenis". Indymedia NL. Retrieved 2009-05-07. ^ "Lawaaidemo voor Ollie aan de poorten van de Burgse gevangenis". Indymedia.be. 2009-03-05. Retrieved 2009-05-07. ^ a b Cory Doctorow. "Wired 5.09: Dumpster Diving". Wired. Retrieved 2009-05-07. ^ "Theft Act 1968". legislation.gov.uk. ^ Politische Mahlzeiten. Political Meals. LIT Verlag Münster. 2014. p. 139. ISBN 978-3643126887. ^ Malkus, Max (2016). "Containern – strafbar und strafwürdig?" (PDF). Magazin für Restkultur. 4/2016: 2. ^ "Archiv". die Tageszeitung. Retrieved 2009-05-07. ^ "TENNANT CO. v. ADVANCE MACH. CO., INC. 355 N.W.2d 720 (1984)". ^ Harrison, Jeff (18 November 2004). "U.S. Wastes Half of Food Produced". Retrieved 2010-03-07. ^ "Dumpster Diving". Paghat the Ratgirl. Retrieved 5 April 2015. ^ "Food or Perishables". Retrieved 24 July 2017. ^ "Things I find in the Garbage". Retrieved 5 April 2015. ^ "How to Scavenge for School Supplies". Retrieved 24 July 2017. ^ Ha, Tanya (6 November 2003). "E-waste". Australian Broadcasting Corporation. Retrieved 2007-06-11. ^ "What metals can be recycled?". University Of Cambridge. Retrieved 3 April 2015. ^ Markson, David (October 1981). "Become an Urban Lumberjack". Mother Earth News. Archived from the original on January 5, 2016. Retrieved January 5, 2016. ^ Sustainblog (September 2011). "The Urban Lumberjack – The Accidental Eco-Warrior of the City". Sustainblog. Retrieved 2017-03-30. ^ "Sudbury local news-Bedbugs found on discarded mattress at apartment complex". northernlife.ca. Retrieved 30 March 2015. ^ "5 Tips for Avoiding Bed Bugs With Second Hand Furniture". HowStuffWorks.com. 3 August 2012. Retrieved 28 January 2018. ^ Lawrence, Robyn Griggs (6 May 2011). "College Graduation Means Great Dumpster Diving". Retrieved 2012-11-07. ^ "Classic MMOG Raised From the Dead by Past Players - Slashdot". Games.slashdot.org. 2005-06-21. Retrieved 2012-09-07. ^ Greenwell, Megan (2006-08-16). "Diving for Dinner". washingtonpost.com<!. Retrieved 2009-05-07. ^ Saner, Emine (2009-12-22). "Skipping: is there anything wrong with taking the food that supermarkets throw away?". The Guardian. Retrieved 30 January 2014. ^ Malcolm Walker (2013-12-04). "Why Iceland wanted the bin theft case dropped". The Guardian. Retrieved 30 January 2014. ^ Robinson, Kim Stanley (2005). Fifty Degrees Below. Bantam Books. ISBN 9780553803129. ^ Cory Doctorow (2005). "Someone Comes to Town, Someone Leaves Town". Cory Doctorow. Retrieved May 23, 2015. “Well, you sure have a lot of stuff, I’ll give you that,” Alan said. “It’s all dumpstered,” Kurt said casually. “Oh, you dive?” Alan said. “I used to dive.” It was mostly true. ^ Cory Doctorow (2012). "Pirate Cinema". Cory Doctorow. Retrieved May 23, 2015. "Easy there, old son. Watch and learn." He led me around the back of the shop, where two big skips -- what they called "Dumpsters" in American films -- sat, covered in safety warnings and looking slightly scary. Without pausing, Jem flipped up the lid of the first one. He peered inside. A funky, slightly off smell wafted to me, like the crisper drawer of a fridge where a cucumber's been forgot for too long. ^ Taborelli, Silvia (2008). "Surfing the Waste: A Musical Documentary about Dumpster Diving". NISI MASA, European Network of Young Cinema. Archived from the original on November 7, 2014. Retrieved November 7, 2014. Liz, Mike, Allison, Owain and Alden are five youngsters living in Montreal. They dance, sing and play in this upbeat short film which tells about "dumpster diving". It may sound like a sport, but it's actually a way of life. ^ Aflalo, Paul (November 25, 2008). "Surfing the Waste, making it's World Premiere at IDFA 2008". Indyish. Retrieved November 7, 2014. ^ "One Man's Trash is Another Man's Treasure". Reno Gazette-Journal. Retrieved November 7, 2014. ^ Fortenbury, Jon (May 26, 2011). "Diving Team: Come on in, the Dumpster's fine". NewsReview. Retrieved November 7, 2014. ^ WorldCat (2007). "I Love Trash". OCLC. Retrieved November 7, 2014. ^ Skyfest (2007). "Feature Documentary: I Love Trash". Skyfest Film and Script Festival. Retrieved November 7, 2014. ^ Skyfest Film & Script Festival (2007). "Winners SkyFest I". Green Planet Films. Retrieved November 7, 2014. ^ Seifert, Jeremy (2010). "Dive!". Compeller Pictures. Retrieved November 7, 2014. Inspired by a curiosity about our country's careless habit of sending food straight to landfills, the multi award-winning documentary DIVE! follows filmmaker Jeremy Seifert and friends as they dumpster-dive in the back alleys and gated garbage receptacles of Los Angeles' supermarkets. In the process, they salvage thousands of dollars worth of good, edible food... Winner of 21 Awards by Festivals Worldwide. ^ Mallis, Alex (2012). "Spoils: Extraordinary Harvest". Analect Films. Retrieved November 7, 2014. Emulating the tradition of American Direct Cinema, filmmaker Alex Mallis captures intimate portraits of the divers, illuminating a practice as old as agriculture. Mallis' fly-on-the-wall access to these Brooklynites bring us along for a journey through the culture of dumpster diving, offering an unvarnished glimpse into one night of urban harvest. ^ Lacey, Stephen (November 21, 2012). "Spoils: Film Documents Americans Who Reap An 'Extraordinary Harvest' From Waste". ThinkProgress. Retrieved November 7, 2014. ^ A WG Film Production (2008). "A Recycled Road Trip". theleftovers.net. Retrieved November 7, 2014. A group of five diverse people have challenged themselves to drive 2000 km down the east coast of Australia in a veggie oil powered van, living on nothing but waste. With zero money but plenty of passion they put both themselves and society to the test. ^ "From Dumpster To Dinner Plate". fromdumpstertodinnerplate.com/. 2011. Retrieved November 7, 2014. Evasion, (2003), CrimethInc. Far East, an autobiography detailing one anarchist's shoplifting- and dumpster-diving-supported travels. Eikenberry, Nicole; Smith, Chery (2005). "Attitudes, beliefs, and prevalence of dumpster diving as a means to obtain food by Midwestern, low-income, urban dwellers". Agriculture and Human Values. 22 (2): 187. doi:10.1007/s10460-004-8278-9. 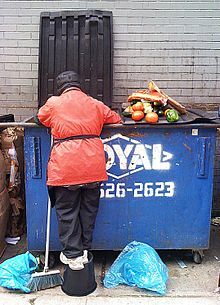 Wikimedia Commons has media related to Dumpster diving. Fallingfruit.org/dumpsters, Falling Fruit's global map of food-bearing dumpsters and other freegan resources. Bask In The Glory Of The Bin: An article covering the retrieval of sensitive data from the humble bin.